Day 3 was Friday. After a lazy start and a HUGE breakfast at our favourite diner in Brooklyn we headed back uptown to Harlem because we wanted to visit the sites of the original social dance ballrooms which made Swing and Lindy Hop famous. 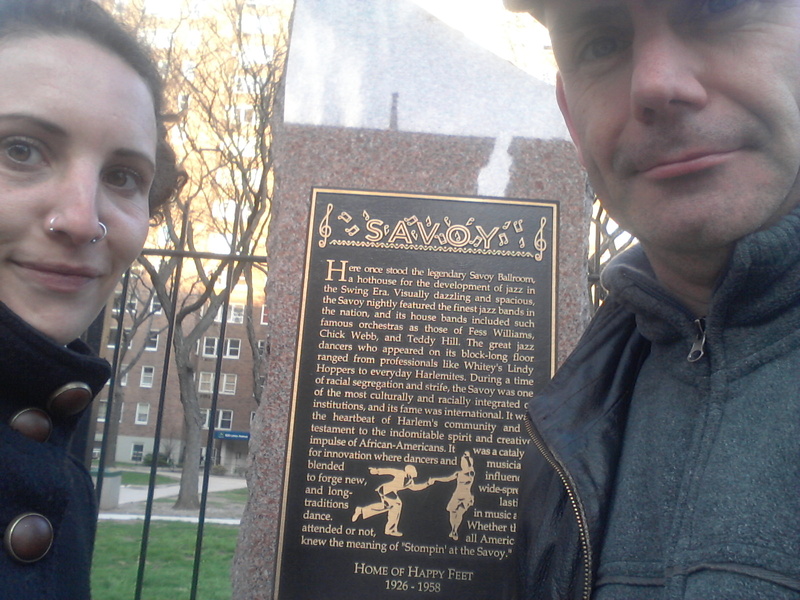 We visited the locations of the Savoy and the original Cotton Club. What is amazing is that the two locations were SO CLOSE together on the same street. 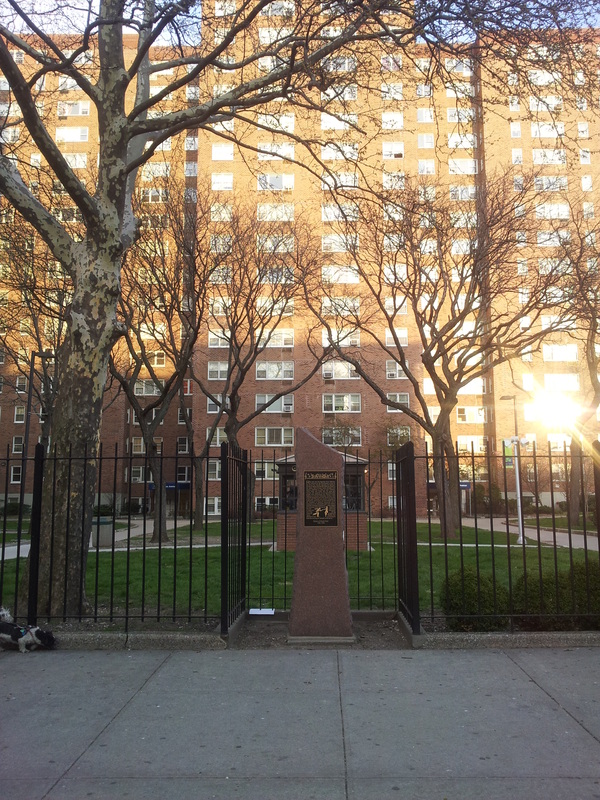 The Savoy was at 596 Lennox Avenue and the Cotton Club at 142nd Street and Lennox Avenue – we’re talking only a couple of hundred meters! This is why visiting places gives a different dimension to just reading about them. We were able to imagine flocks of people at the time heading out for a night’s dancing sharing the same physical space on the street if not in the ballrooms themselves – the Cotton Club was whites only, the Savoy mixed. After this we continued our exploration of Harlem and went to the Alhambra Theatre just a few blocks away. 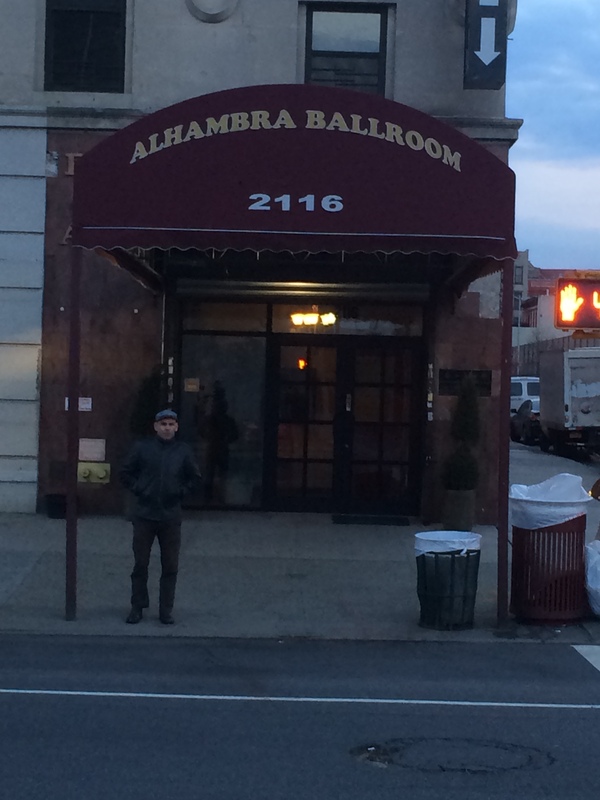 The Alhambra still exists at 2116 Adam Clayton Powell Jr Blvd. 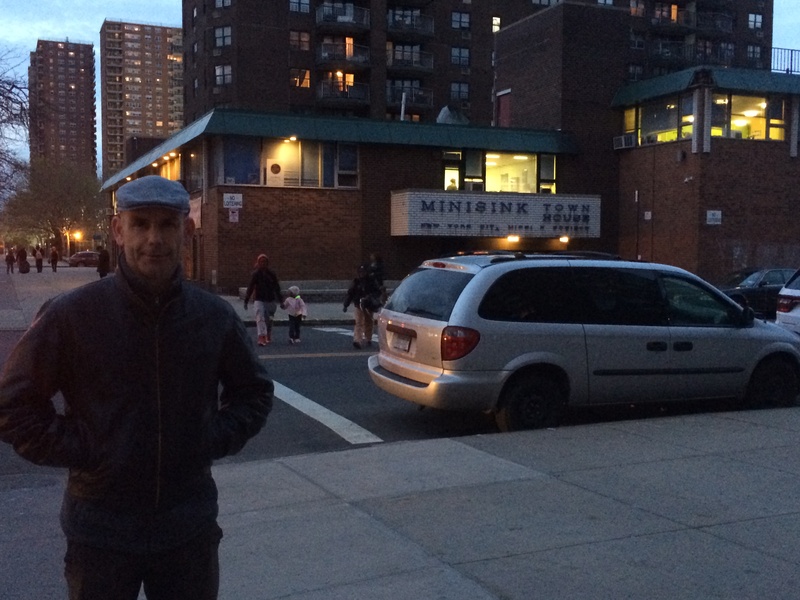 We went in and talked to the receptionist Ernest Daney about the past…. Today we post photos of both locations and have a great interview with George Lucas (yes, GEORGE LUCAS!!) from the New York City Mission Society, an institution created to help local kids, which was built directly on the site of the old Cotton Club. Our exploration of Harlem complete (but having the feeling that we’d be back before the end of our trip) we went home and got prepared to go out to SWING 46, a seven days a week Live Music Swing Club, close to 42nd Street. Swing 46 is famous the world over. There we saw George Gee and his orchestra. 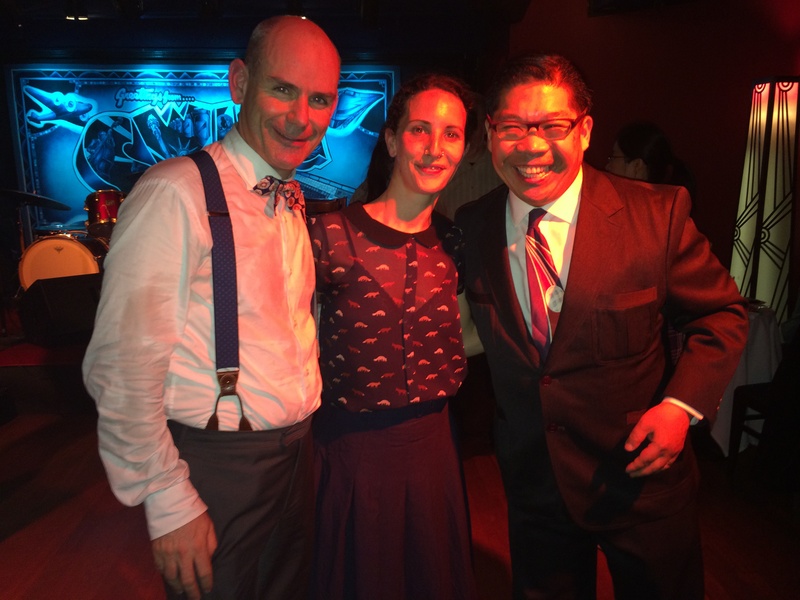 George is a favourite with Lindyhoppers in NYC and many dancers usually go to Swing 46 on a Tuesday night. What was lovely was that we started to see the same people who we had seen on previous nights and started to get a feeling about the Swing and Lindy Hop community here in NYC. Stephanie Shapiro who works as a dance teacher in the space which hosts Frim Fram on Thursday nights (see Day 2 of our blog) was there and we said hi. As it turned out George Gee had also been DJing in FrimFram for a while on Thursday but at that time we didn’t know him! We were delighted when George agreed to do an interview with us about his music, changes in the Swing music world and about Swing 46 the club itself. The interview’s RIGHT HERE !!!! We were the last people to leave… at 3am. Subway home and at 4am we rested our weary heads. Day 3 Done and dusted! For Day 4 we promise you MORE Brooklyn, MORE music with THE INCREDIBLE Glenn Crytzer and his Savoy 7 at the JCC in Manhattan together with a fantastic interview with the one and only Paolo Pasta Lanna !!!! SO MUCH SWING. SO MUCH FUN !!! !